The 2018-19 Indiana State Employees Community Campaign (SECC) got off to a roaring latesummer start at the Statehouse Market, and that enthusiasm never waned as the pursuit of a recordsetting season of giving drew to a close just before Thanksgiving. Days later, as the Torch was going to publication, it was clear the $1.5 million goal set at the outset of the campaign had been reached. More details will be shared in a separate special announcement. Reaching the goal was the “icing on the cake” of an SECC that could be viewed only as a success. State of Indiana employees gave at a pace exceeding even last year’s enviable mark of more than $1.4 million. Anthem’s Employee Assistance Program (EAP) will place an even greater focus on mental and emotional health with an expansion of benefits for State of Indiana employees. From assembling bikes for kids to building homes for families in need to landscaping at an organization helping homeless veterans get back on their feet, members of the Indiana Department of Revenue (DOR) are all-in on giving back. 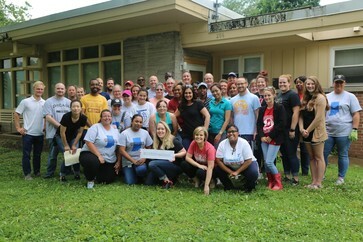 Through a program launched earlier this year called “#DORGivesBack,” 139 employees logged more than 550 hours of community service, working with nonprofits such as Habitat for Humanity and the Boys and Girls Club of America. If you have not received your flu vaccination, check out the Flu Vaccine Finder. Just enter your zip code to find flu shot clinic locations near you. You can download the state employee newsletter from the Indiana State Personnel Department (INSPD) website. Miss an issue? Archived issues of The Torch are available at www.in.gov/spd/2540.htm. Email the SPD Communications staff if you have any problems viewing the newsletter, subscription questions or if you would like to suggest an article.